This month, we are being subjected to not one but TWO sequels to hit comedies from the past couple of years, and bizarrely both of them are set around Christmas, and have to do with the main characters’ dysfunctional relationship with their own parents. Daddy’s Home 2 will be looked at a little later in the month, but for now A Bad Moms Christmas sets the bar just low enough to make room for whatever the former turns out to be. While the first Bad Moms wasn’t a majorly hilarious outing, it was still funny where it counted and way more heartfelt than it ever had any business being. Even so, despite it becoming a sleeper hit at the box office, nobody was really asking for a follow-up for what felt like a premise strong enough for just one film, and certainly not one that took place over the holidays; yet here we are, and the unnecessariness of its entire being is felt all throughout A Bad Moms Christmas, though its minor amount of laughs do prevent it from being an unholy waste of time. Set just a few days before Christmas, put-upon mothers Amy (Mila Kunis), Kiki (Kristen Bell) and Carla (Kathryn Hahn) are in the midst of preparing for their respective family traditions, though are constantly stressed out by the severe pressure put on them to get everything prepared for their kids and families in time for the big day. They decide to let loose once again and give their families a much more relaxed Christmas this year – unfortunately, those plans are thrown into disarray when their own mothers show up to add even more stress to their overgrowing pile. Amy’s uptight, controlling and utterly self-absorbed mother Ruth (Christine Baranski) practically barges her way into their home and assumes her strict rule on the family; Kiki’s mother Sandy (Cheryl Hines) is creepily obsessed with her grown daughter, to the point where she gets her hair styled in the exact same way as Kiki’s and even watches her sleep next to her husband in the corner of their bedroom; and finally Carla’s maternal figure is Isis (Susan Sarandon) – and yes, there’s a reference to the OTHER entity known as ISIS at a few points in the film – a free-wheeling gambler who suddenly shows up with a possibly financial-based motive. All three must now fight the overbearing tendencies of their elders if they are to actually pull off their more relaxed idea of a family Christmas. It is weird how, again, we’re getting the exact same movie twice in one month, though I’m going to take a wild guess and say that Daddy’s Home 2 won’t have nearly as much cursing or drinking or Kathryn Hahn waxing a man’s privates while she’s flirting with him. That scene, by the way, is one of the few comedic highlights of the film, because it’s one of the few that actually makes it feel like a sequel to Bad Moms and also because Hahn is such a comedic delight in this film that she makes even the lamer jokes remotely funny. Other than that, this is mostly just a lighter version of the first film that’s not as funny or endearing, and it certainly isn’t as fresh or even as liberating; it panders it a bit more to the audience this time round, with an extra helping of sap in the more emotional parts of the film that don’t make it feel as genuine. The addition of the Christmas setting is a welcome one, but the filmmakers don’t take much advantage of the satirical opportunities that are presented from it, and you’re left with a film that’s trying to be like many other adult-orientated festive comedies that have done this kind of plot before and in much funnier ways. 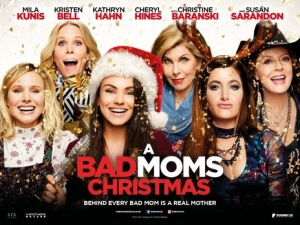 That said, while there may not be as many laughs this time as there were in the first Bad Moms, there is at least an attempt to make it feel like a natural predecessor, even though it doesn’t always work. As before, Hahn is the comedic highlight of the film, and it’s nice to see actresses like Christine Baranski, Cheryl Hines and Susan Sarandon acting on-screen together, even when they’re not playing the most sympathetic characters (Baranski, in particular, is playing such a cartoonishly one-dimensional wet blanket that it doesn’t seem logical for her to have any emotional moment the film attempts to give her). They help make the film not necessarily great, but at the very least gives it a slightly higher edge over previous festive comedy sequels like Bad Santa 2. Though it’s not really a good movie, and certainly nowhere near as fun as the first one was, there are still a few moments of entertainment throughout to prevent it from being completely skippable. If this is your way of getting into the Christmas spirit, this one isn’t the best you could check out, but is certainly an okay start. A Bad Moms Christmas doesn’t retain the fresh and funny spirit of its predecessor, but contains a good few decent laughs that help prevent it from being completely avoidable.